Norton provides online scanner to scan the infected computer. Norton is providing it free of cost. 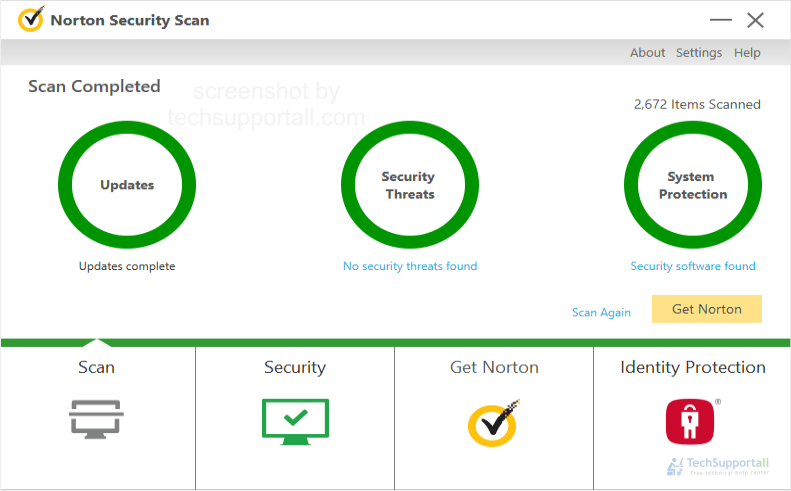 To make sure that your computer infection free scan your computer with Norton Security scanner. You still can use this, if have already installed an Antivirus software in your PC. It will make sure that your existing antivirus is working fine. Online virus scanner by Norton (Symantec) is a completely free online virus scanning service. It scans your computer and lets you know if any virus / malware / spyware are present in your computer. But it will not clean up them, it will only show you the presence of virus. To remove them, you may need to buy Norton security. It is useful if you are doubtful whether your computer is infected or not in free of charge. A minimal installation required to scan computer through Norton online scan. It will scan your computer through online virus definition or a cloud based antivirus instead of downloading any virus definition on your computer. That’s why it’s called online scanner. Why choose Norton online virus scan? Norton is one of the most famous names in anti-virus protection, so you will have the comfort of knowing that you are in safe hands. The experienced, expert staff at Norton have designed this software to work fast, without getting in the way of your everyday work. Despite this, Norton online virus scan is very powerful. Use it as a second opinion to make sure that your existing antivirus is catching all threats. To clean an infected PC. Trusted name in the PC security industry. How to use Norton online free scanner? You don’t need any special knowledge or expertise to use Norton Security Scanner, because everything is designed to be easy and user-friendly. All you need to do is to download a small setup program from the official website – this is under 1 megabyte in size. When you run this, you will see prompts that will take you through the steps of using the scanner. It is compatible with Windows 10, 8, 7 etc. It will make a full and detailed check of your hard drive and any programs you have installed. If there are any viruses, Trojans, or other malware, Norton Security Scan will flag these up in an easy to understand way. You will then be able to decide what you want to do next, which will usually be to get rid of the malware. If you have any question or doubt feel free to write in the comment section. Q: Does it require internet connection? A: As its name say it is an online virus scanner, so you need an internet connection to run this tool. For offline scanners refer to this page : Offline virus scanners. Which one advertisement do you want to remove ? Please explain me more so that we can help you to remove it. the link stopped going to the good site. now we have to download a file. is it good to download? Yes, Norton antivirus is the best protection for computer. We recommend Norton antivirus to everyone. Norton is the no. 1 antivirus in the world. INorton sent an email about a ,malware that was removed and I was to click the yellow box to restore my homepage. I cannot access at all by clicking the box thus cannot get Google as my home page. That you help it become seem to be easy with your powerpoint presentation even so to find this disorder to be truly something which I am I’d never ever recognize. It seems as well elaborate and incredibly big personally.. Thư viện số I’m shopping in advance for your next put up, I am going to attempt to have the adhere from it! Sure, we recommend you to run a scan “Norton Power Eraser”, “Malwarebytes”, “Hitmanpro” to fix your computer. i don’t want to down load the programme i want to run the online scan is this still available or is it download only and then to remove or repair you have to pay is that right ? so its not free ??? ?